Flu and cold season comes and goes every year. This year, let it pass you by. Boost your immunity with these top flu fighting foods. Stocking up on hand sanitizer this time of year? You may be surprised to learn that 70% of our immunity comes not from keeping our hands clean, but from what is going on in our gut! What, and when you’re eating can have a major effect on your immunity, and be the deciding factor as to how quickly you’re able to fight off the flu, or if you even catch it in the first place. The immune system needs plenty of nutrients (from food, not just Cold FX) so if your diet is poor you’ll be sick more often. Our gut relies on having a healthy balance of prebiotics and probiotics. Prebiotics: are a specialized plant fiber that nourishes the essential and good bacteria already in the large bowel or colon. They basically act as a fertilizer for the good bacteria, producing more. Healthy Carbohydrates: beans, barley, oats, quinoa, wheat, sweet potatoes. Probiotics: Probiotics are bacteria that line your digestive tract and support your body’s ability to absorb nutrients and fight infection. They basically act as a ninja fighting to protect your gut, your immunity, and your health. Fermented Products: Kombucha (available at health stores, pronounces come-boo-cha is a juice like beverage), pickles, sauerkraut, soy sauce, wine (yes, wine – the stronger, more bold, red wine). “Feed a cold, starve a fever?” Not necessarily true. Research hasn’t confirmed either are beneficial. 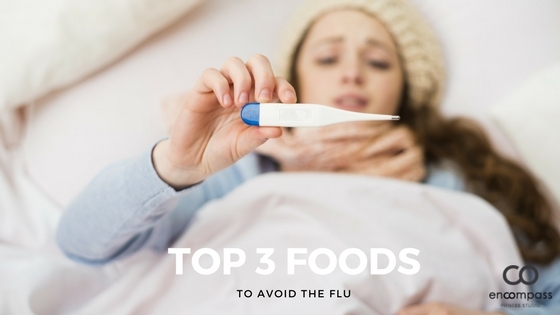 Whether you catch a bacterial infection like a fever, or a viral infection like a cold, listen to your body and eat when you are hungry, and don’t if you’re not. Garlic: acts as an antibiotic and can lessen your symptoms. Green tea: Boosts B cells and helps fight off pathogens. Chicken soup: Provides fluids, electrolytes, and anti-inflammatory nutrients to decrease symptoms. Honey: is a natural and effective cough suppressant and has antibacterial and anti-fungal properties. When you're under the weather, avoid any high intensity exercise. Focus on light aerobic exercise such as a walk outdoors, or a slow walk on the treadmill or bike within the comfort of your home. Avoid public gyms and fitness studio's where you risk of spreading pathogens or catching another strain while your immunity is compromised. Give yourself a week to recover and ease yourself back into your regular routine while listening to your body.